Tune: Mary Had a Little Lamb or Do You Know the Muffin Man? Made the world, made the world? Do you know who made the world? It was God who made the world. I Corinthians 13:4-8 (NIV) - Love is patient, love is kind. It does not envy, it does not boast, it is not proud. It does not dishonor others, it is not self-seeking, it is not easily angered, it keeps no record of wrongs. Love does not delight in evil but rejoices with the truth. It always protects, always trusts, always hopes, always perseveres. Love never fails. Taking Care of Me: Where is my nose? 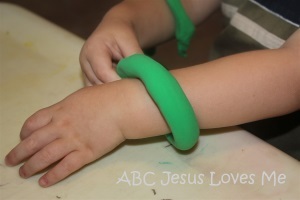 - ABC Book: Using a square sponge, stamp green paint on the Earth worksheet. Color Train - Add a green train to your Color Train by having the child color, with a jumbo crayon, the green train. Display the train at the child's level to point and discuss the colors. Using green construction paper, cut out a large square. Using minimal water, have the child water paint the square. Talk about the shape as the child paints. - Using the Bird worksheet, explain that the child has a nose but the bird has a beak. - Instruct the child to decorate the Bird worksheet with a green dot marker. - Find pictures of birds in the books that you read and point out birds outside. - Flap your arms and walk around the room like a bird. - A bird says "tweet." "Done" is especially helpful at meal time or bath time. Before you remove the child from his high chair or the bathtub, help him sign "all done." If the child refuses to do the sign, gently hold her hands and assist her in completing the sign. With repetition and consistency, the child will begin to use this sign to let you know when he is finished with an activity. - Add the verse: "Old MacDonald had a bird...with a tweet, tweet, here..."
- Sing the song throughout the day adding different items to the farm.